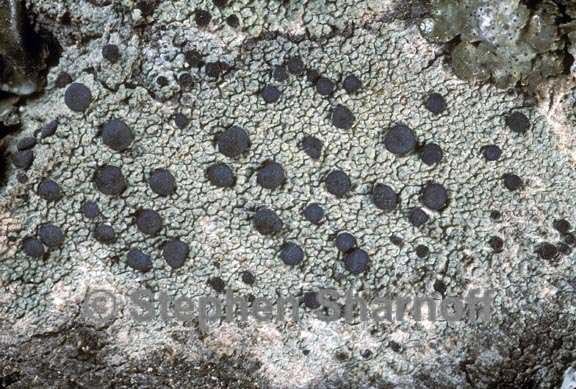 Thallus: crustose, granulose, rimose to areolate, 0.30.5(-1.2) mm thick; prothallus: absent or present, black surface: whitish to yellowish gray or yellowish to grayish white, smooth, dull, without soredia or isidia Apothecia: moderately abundant, orbicular, semi-immersed to sessile, slightly constricted at base, 0.8-1.2 mm in diam. disc: black, plane to convex to strongly convex when old, epruinose margin: distinct from the beginning, up to 0.1 mm thick, becoming excluded exciple: bluish to greenish black, without algal cells parathecium: reddish brown to rarely yellowish brown, without crystals epihymenium: blackish green to bluish green, rarely hyaline only when yellowish crystals are present, with or without crystals hymenium: hyaline, 55-75-100 µm tall, not inspersed; paraphyses: simple, rarely anastomosing or branched, not or slightly thickened apically hypothecium: reddish brown to rarely yellowish brown asci: clavate, lecanoral, 8spored ascospores: hyaline, simple, broadly ellipsoid, ellipsoid to ovoid, 7-16 x 4.5-10 µm; wall: thick and smooth, not halonate Pycnidia: not seen Spot tests: thallus surface: K+ yellow, KC+ yellow, C+ orange, P+ yellow Secondary metabolites: 2,5,7-trichloro-3-O-methylnorlichexanthone, 3-O-methylasemone (=4,5,7-trichloro-3O-methylnorlichexanthone), 3-O-methylthiophanic acid (=2,4,5,7-tetrachloro-3-O-methylnorlichexanthone), 5,7-di chloro-3-O-methylnorlichexanthone, atranorin, isoarthothelin (=2,5,7-trichloronorlichexanthone), and thiophanic acid (=2,4,5,7-tetrachloronorlichexanthone). Substrate and ecology: on wood or bark in the alpine zones World distribution: temperate parts of Asia, Europe, and North America Sonoran distribution: widespread in Arizona, southern California, Baja California, Chihuahua and Sinaloa. Notes: Lecidella euphorea can be distinguished from L. elaeochroma by its usually smaller apothecia, narrower exciples, thinner hypothecium and smaller spores. Lidella euphorea has in the Sonoran region often an inspersed epihymenium (crystals) which cannot be observed in L. elaeochroma. Lecidella elaeochroma has often an inspersed hymenium, not crystalline, whereas L. euphorea has no inspersion in the hymenium but often has a crystalline inspersion in the epihymenium.